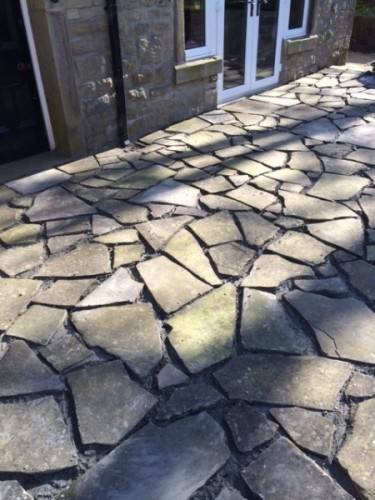 We always enjoy working on random stone patios as they have a lot of character and are a challenge to piece together. First we dug to 6 inch and laid a base of MOT. 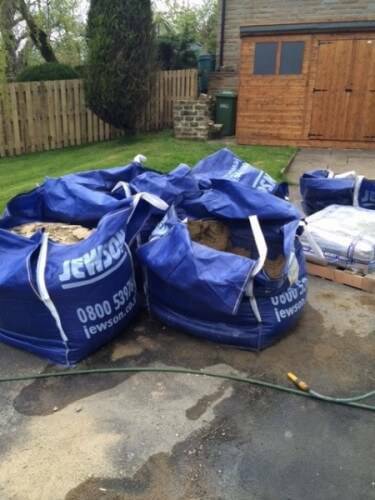 This time we didn’t use a string line as the garden area we were working on was not level and the customer wanted us to keep it that way originally. By doing this, we were using a level often to ensure water was running away from the house. and there was no dips so no puddles formed. With the slight up and down flow of the surrounding garden we have to make sure that all the water run towards garden and drains. 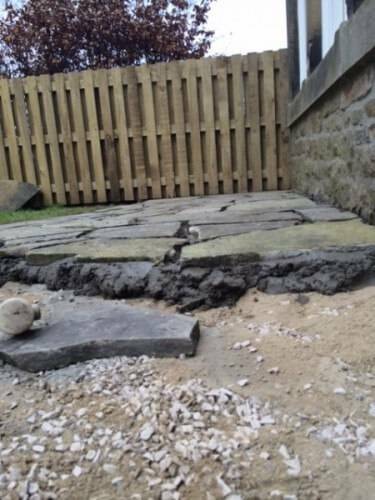 The stone we lifted, staked up and slowly repositioned on to a bed a grit sand to a 4 to 1 mix. the costumer want to keep the curve of the previous patio so we built it just the same. 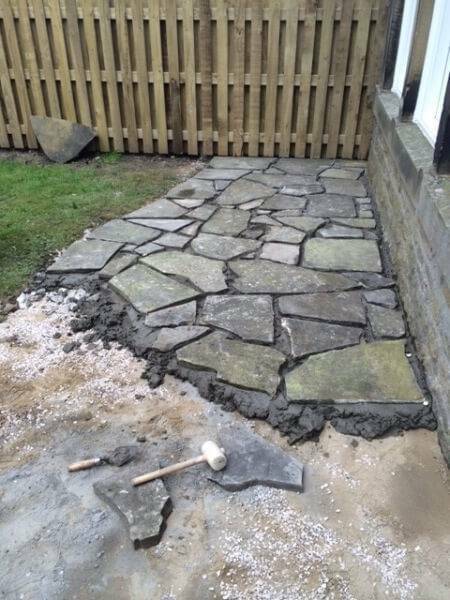 A long level is put across the stone being laid and previously laid ones to ensure that everything is flowing in the right direction. The stones a tapped into position with a rubber mallet. One of the most important tools on this job was the human eye. staining back and making sure everything looks right to the eye was very important and helped us achieve the finish. 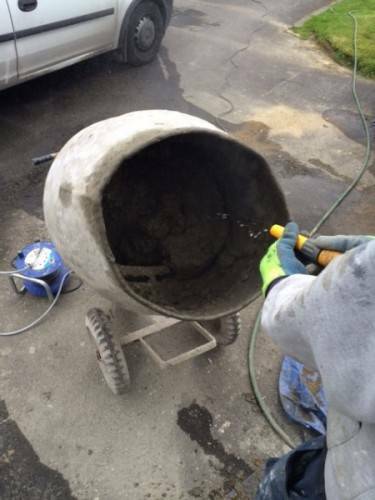 Once the cement has set we went back to point the mortar lines with a 3 to 1 mix of pointing and river sand. all the pointing was finished to a brush finish. 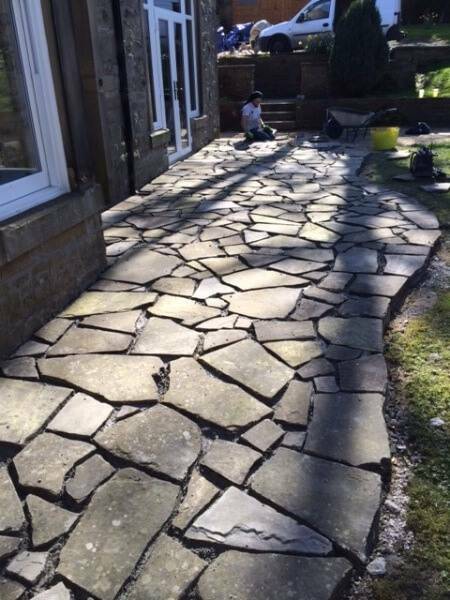 TF Building are a Skipton based Building company that specialise in random stone patios and work in and around the local area. please give us a call if you are are interested a estimate for on of our random stone patios on 07985711011.